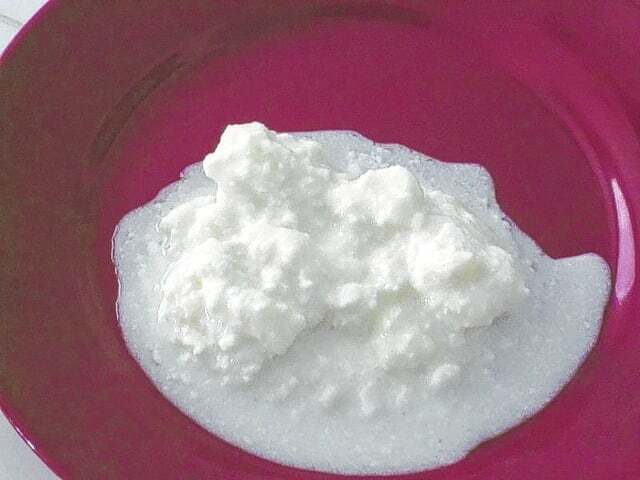 Kefir, pictured here, looks similar to cottage cheese. OHIO VALLEY — Kefir, one of the world’s oldest cultured milk products, is a self-perpetuating food source made from fermented milk. The name derives from a Turkish word for well-being and claims of its health benefits are growing worldwide. Kefir is made by adding “grains” to a quantity of milk. Referred to as kefir grains, they are live cultures containing yeast and naturally occurring friendly bacteria, including lactobacilli, streptococci-lactococci, acetobacter. This symbiotic community of micro-organisms forms small, irregular, opaque clumps that look like cottage cheese. When grains are added to a quantity of milk, they ferment the liquid and also act as a food source for the kefir. The grains and milk are placed in a container that is not air right and the mixture is not refrigerated. After about 24 hours, the grains are strained out of the liquid. What is left looks similar to liquid yogurt. It’s consistency is thick, white, creamy and bubbly. The flavor is tart, slightly sour and yeasty, often described as a cross between yogurt and buttermilk. The grains that were removed from the liquid are added to fresh milk for use in successive batches. Kefir grains, if well cared for, will last a lifetime. It is believed that all kefir grains in the world today originated from a culture from the Caucasus Mountains thousands of years ago. Although Marco Polo mentioned it in the chronicles of his travels, kefir was unknown outside the region until about 100 years ago. The origins of kefir are a mystery, but legends abound. Once such legend claims kefir grains were a gift from the Prophet Mohammad to the Orthodox people of the region. They closely guarded their grains and their knowledge of kefir in fear that the grains would lose their “magical” strength. Nomadic horsemen of the northern Caucasus Mountains who drank the kefir reportedly lived past the century mark. Some think the probiotic bacteria in kefir might be the reason why, but to date there is no scientific evidence for the claim. A 2003 Ohio State University study did show it curbed flatulence in those with lactose intolerance. Kefir contains easily digestible complete proteins. The abundance of beneficial yeast and bacteria provide lactase, an enzyme that consumes most of the lactose left after the culturing process. Kefir is a popular drink across eastern and northern Europe today and it is the most popular fermented milk in Russia. In some countries, the original method for making the liquid is still used. Horse bladder saddle bags full of it still swing over front doors. By hang it in the doorway, people coming through slap the bags. This agitates the liquid and makes it grow faster. Warren Taylor, of Snowville Creamery in Pomeroy, is one of kefir’s leading advocates. He calls himself a “dairy evangelist” and hopes to convert others to what’s been his way of life for almost 40 years. It was during a dairy technology class that Taylor first learned about kefir. His first grains were shipped from Holland, and that was the beginning of his kefir culture. According to Taylor, he drinks a quart each morning and feels great. As proof that kefir is a sustainable food source, Taylor’s culture is from his original source and he generously shares with interested parties. With the growing attention kefir has been receiving, it is important to note that not all kefir is the same. While there are claims that kefir can be made in a dairy lab, many of kefir’s strongest proponents disagree. They believe that real kefir comes from the original source and cannot be duplicated. Kefir is an interesting project and there are no exact instructions for growing the liquid. It requires daily attention and is very dependent on quality of the milk, grains and temperature. Every person’s kefir will be slightly different . Only time will tell if kefir has all the health benefits many claim, but for now, many people say it does make a wonderful addition to smoothies. Lorna Hart can be reached at 740-992-2115 EXT. 2551.